A reader asked me where she could get lessons on RESPECT for middle school. Q: My hat off to you! As a counselor we many hats, and you seems to be wearing many more than that. I appreciate reading the blogs which I’ve signed up to receive from you. I would like to know if you have any articles or activities dealing with “RESPECT” and “Personal Self”? If you do, I hope you would share them with me. Do you have an archive of your counselor’s blogs? I’m a counselor in the middle school and I love it! A: There are many different websites and books I use to find lessons. Below, I have written about a new resource I have use to find lessons on respect (and much more!) and other resources I have used in the past. Also, see the bottom of the School Counselor Blog website for an archive of all of my previous posts! I recently got the Safe and Caring Schools series from Free Spirit Publishing for my school. The series is great and the other counselor and I have already utilized some of the worksheets in the books. There is one Safe and Caring Schools book for each grade level up to eighth grade: Safe and Caring Schools: PreK-K , Safe and Caring Schools: Grades 1-2 , Safe and Caring Schools: Grades 3-5 , and Safe and Caring Schools: Grades 6-8 . Each book is broken down in to theme sections. There is a specific section on "Respecting Yourself & Others." Each Safe and Caring Schools book comes with a CD that includes printable excerpts from the book. What I love the most about this series is that each section has literature connections as well as ways you can connect the content to other subjects. I am using the Safe and Caring Schools series this year in my work with students and I highly recommend it. To get a better idea about what the books include, download excerpts from the series. Safe & Caring Schools: Grades 3-5 Table of Contents, Safe and Caring Schools: Grades 3-5 Parts 1 and 2, and Safe & Caring Schools: Grades 3-5 Bullying Section (January). There is also a Safe & Caring Schools poster series available through Free Spirit Publishing. I wrote a blog entry in the past about where to find respect lessons. One of the sites I mentioned in my previous post about respect lessons was Teaching Tolerance. I have used Teaching Tolearnce for many, many lessons! I wrote about some great resources you can access from Teaching Tolerance in a previous blog post about great websites for counselors. Other resources I mentioned in my previous post about respect lessons include the National Education Association (NEA) website and The Freedom Writers Diary Teacher's Guide by Erin Gruwell. Another website with respect lessons is Character Counts. The Character Counts website has a free lesson plan bank that is searchable by character pillar and grade level. At the bottom of the School Counselor Blog website there is an archive of all of my previous posts. Another way to access my previous posts is to use the wibya search bar at the bottom of my page to search this site, click on the star to see recent posts, and click on the crossing arrows to see a few random posts. Know about any great resources for RESPECT lessons! Comment below, email me, tweet, or share on the School Counselor Blog Facebook Page! How Can I "Chill Out" When I'm Feeling Upset? As part of the anger management groups I facilitate, I brainstorm with students ways they can "chill out" if they are feeling upset. Students have great ideas of what they can do when they are feeling upset. I wanted to find a more permanent way to share students' ideas. After making my Where's the Counselor? dial I used the extra scrapbook paper to display students suggestions for ways to "chill out" on the wall of my office. The best part about this easy to make display is that if students come up with more suggestions I can easily add them to my wall. To make this display, I printed the question "How can I 'Chill Out' when I'm feeling upset?" and the words on computer paper. Using a paper cutter , I cut the words out. I then cut Diecuts With A View 8 by 8 Grade School Stack scrapbook paper for behind the computer paper words, leaving enough room for a border. I laminated all the words and the question. I used removable foam mounting squares to mount the words and question on the wall. Share your creative ideas! Comment below, email me, tweet, or share on the School Counselor Blog Facebook Page! School Counselor Blog's first guest post! One of the students' favorite (and mine too!) activities to choose to play with is the sand tray. There really isn’t a “wrong” way to use the sand tray. Some children use objects in the sand to tell a story, some simply play with the sand because it is soothing to them, some do not say anything but the themes in their play tell the whole story. It really is powerful to watch! When I was in graduate school, I used a wooden sand tray. However, when I looked into getting one of my own, I realized they are very expensive! If you are like me and you have to travel between schools, or you are just starting out and and do not have the money to buy an expensive wooden sand tray, I have a great solution! I simply bought a clear plastic container (mine is approximately 8-10 inches deep) from Walmart which cost around five dollars. I got one with a locking lid since I knew I would be traveling with the tray and moving it around a lot. Sand is affordable if you buy it from a home improvement or lawn care store. (Tip: Sand is usually seasonal. A good time to buy sand is in the summer when sandboxes are in season.) I am fortunate enough to live near a sand plant which provides free sand if you are willing to pick it up. Simply pour the sand into a clear plastic container, put the lid on it, and you will have your very own portable sand tray! I always have my sand tray within reach for my students. They love it and I love it! Shelly is a Elementary Certified School Counselor and Nationally Certfied School Counselor. She currently serves four different elementary schools consisting of approximately 1000 students. Shelly is always looking for quick, easy, and cheap ways to stock her four offices! She uses a variety of play therapy techniques with the students, and especially loves sand tray. If you have any questions about sand tray please feel free to comment below or email Shelly! My days are spent running around the school, which makes it difficult when students, teachers, administrators, or other school staff are trying to find me. I was trying to think of a creative way to let everyone know where I am, when I saw a template for a mood dial in Family Fun Magazine . Sometimes I get ideas from unexpected places! I was inspired to craft a dial of my own - a Where's the Counselor? dial! To make the Where's the Counselor? dial I followed the directions for the mood dial in Family Fun Magazine . I used Diecuts With A View 8 by 8 Grade School Stack , school themed patterned scrabook paper, to make my backgrounds. I used Diecuts With A View 8 Inch by 8 Inch Textured Jewels Cardstock Stack , matching scrapbook cardstock for the circles and the dial. For the wording above the dial, I printed out words on computer paper and glued them to the same Diecuts With A View 8 Inch by 8 Inch Textured Jewels Cardstock Stack paper as the circles and the dial. To affix the dial I used a paper fastener . This project was simple to make. It is a fun and colorful way to let students, teachers, administrators, and other school staff know where I am. I now have my Where's the Counselor? dial hanging outside my door. I used removable foam mounting squares to mount it on the tile wall. Share your creative ideas! Are there any books or magazines that gave you an unexpected idea? Comment below, email me, tweet, or share on the School Counselor Blog Facebook Page! M.A., M.Ed., or M.S.? - Which Should You Pursue? A reader asked me about graduate school and which degree is the best for school counselors. Q: I came across your School Counselor Blog yesterday while researching information on graduate school programs for school counseling. I would like to say how awesome your blog is and how much I loved reading through all of your information. As I am only in the beginning stages of looking at grad schools, reading your blog really helped validate my decision of pursuing a master's degree to be a school counselor. Also, I had a question that I hope you can help me out with. Through reading pages and pages of information on different schools and what degrees are offered, I noticed that there are at least three different types of counseling degrees: M.A., M.ED., and M.S. ED. I have read the basic differences on each of these, but is any one of these degrees better than others? (Most specifically when applying for jobs). A: First, I recommend looking at your state's requirements for certification. Some states may have requirements about which degree they want school counselors to have. Here is a listing from the American School Counseling Association website of state certification requirements. As long as the program you choose fulfills your state's certification requirements, it should not matter if your degree is an M.A., M.Ed., or M.S. If the program you choose is not accredited by the Council for Accreditation of Counseling and Related Educational Programs (CACREP), you may have to meet additional requirements in order to fulfill your state's certification requirements. Check out my previous post, Navigating Graduate School for School Counseling, for more information about CACREP and applying to graduate school. What factored into your degree decision? Comment, email, tweet, or share on The School Counselor Blog Facebook Page! Products School Counselors can utilize from Smilemakers! I recently discovered Smilemakers, a company owned by Staples. Smilemakers slogan is "Stickers, toys, and prizes from Smilemakers help you make kids smile!" Smilemakers has some great products school counselors can utilize. Below, I outline the products I purchased and how I plan to use them. I also give suggestions of other products from Smilemakers school counselors may find useful. 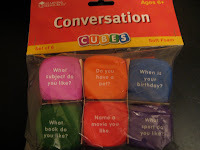 I purchased conversation cubes from Smilemakers to use in my group counseling sessions. I like to do an ice breaker before each session to help students get to know each other and feel comfortable. The conversation cubes are great for this because students can roll the cube and answer the question. The conversation cubes are a big time saver for me! Before I purchased the conversation cubes, I used a paper box template to for my icebreaker questions. The paper box served its purpose, but I found I needed to keep making them over and over again because they got dirty, ripped, or crinkled from wear. The conversation cubes are made out of a soft foam material. They have a similar consistency to a stress ball so they are very durable. 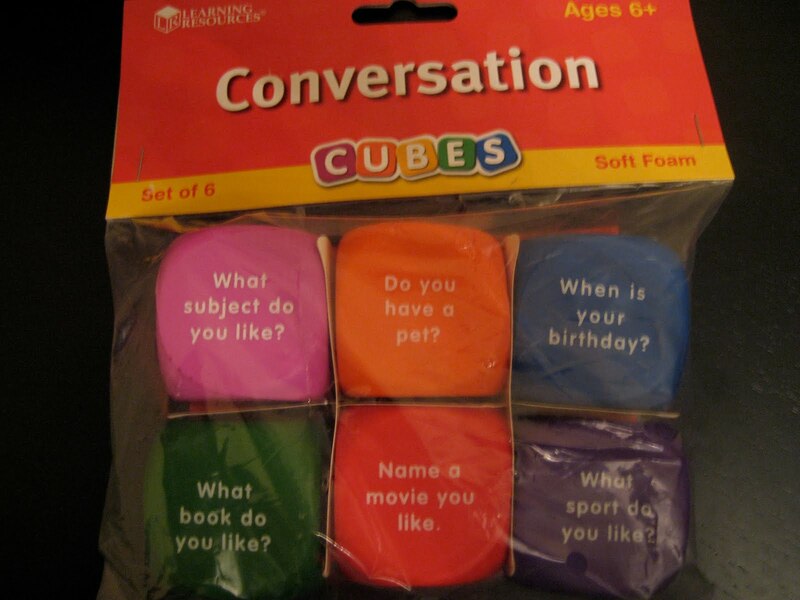 There are 6 conversation cubes in the set with a total of 36 questions. Some of the questions on the conversation cubes include: "What do you want to be when you are older?, What do you like to do in cold weather, and What is the strangest dream you have had?" I have been searching far and wide for large dice. The inflatable dice I purchased from Smilemakers are exactly what I was looking for. I sometimes use dice in groups for icebreaker questions to mix things up a bit. I come up with a numbered list of questions and write them on chart paper. Students roll the die and they have to answer the question that corresponds to the number on the die. Some students have trouble seeing the regular sized die because it is small. Others want to know what number the student picked but can't see across the table. The size of the inflatable die allows everyone to see. Sometimes dice falls on the floor when students are rolling them and it takes awhile for students to find it. Because of the size of the inflatable dice, students will have no trouble finding them if they get dropped on the floor. The conversation cubes and inflatable dice from Smilemakers are perfect supplements for use with Seeing Red: An Anger Management and Peacemaking Curriculum for Kids , a curriculum I use for anger management and conflict resolution groups. Seeing Red has great icebreakers at the beginning of each session that could be utilized for almost any type of counseling group. I plan to facilitate many career related activities this school year. I was looking for career materials to use for bulletin boards and other activities. Smilemakers has a 2 pack of 12 different cardboard Community Helpers Visors. I used the visors to display on a bulletin board I titled "Career Construction Zone." A fan of School Counselor Blog on facebook, Barb, suggested to make the bulletin board a guessing game and have students win a prize if they can correctly name all of the careers. She also suggested using newspaper want ads as a background, which I thought was a really cool and cheap idea. ***Unfortunately during the writing of this blog post, Smilemakers is no longer carrying this product. *** Other places where you could find career hats include: a craft store such as Michael's, a dollar store, Target, or Walmart. If you have other suggestions, please comment below, post on School Counselor Blog Facebook page or email me. Besides pencils, toys, and other giveaways, Smilemakers has a few other cool products school counselors could utilize. Smilemakers has rolls of stickers for counselors to give to students. I thought these stickers would be cool to hand out during National School Counseling Week in February or other events promoting the school counseling program, such as open house or meet the teacher night. My Counselor Sticker Rolls include 5 different sticker styles including: "My Counselor Cares About Me!, My Counselor Thinks I'm Great!, My Counselor Thinks I'm Super!, My Counselor Says I'm Terrific!, and My Counselor Says I'm Special!" The Community Helpers Fun to Know Puzzle is a game where children match the occupation to the tools or equipment they use. The Community Helpers Fun to Know Puzzle is recommended for PreK-1. If the students you work with do not have exposure to many different careers this product could be used in older grades as well. The Community Helpers Fun to Know Puzzle could be used for bulletin boards and as a guessing game for students much like the suggestion for the career bulletin board I created with the Community Helpers Visors. Smilemakers runs different specials all the time. Sometimes they have free shipping on all orders! Sometimes they even send customers 10% off coupons too! I received the items I ordered in about three days! Comment below, email me, or visit the School Counselor Blog Facebook Page to share your favorite products from Smilemakers or other companies!